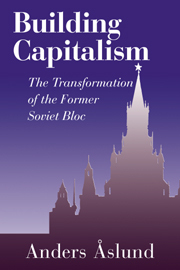 This book offers the most comprehensive empirical analysis of the economic transformation of the countries comprising the former Soviet bloc during the first decade after communism. It debunks many myths, seeing transition as a struggle between radical reformers and those thriving on rent seeking. Privatization has undoubtedly been beneficial, and its positive effects will grow over time. The main problem has been the continuation of large, unregulated and ubiquitous state apparatuses living on corruption, while no country has suffered from too radical reforms. Where malpractices of the elite can be checked, market reforms and democracy have proceeded together. List of tables and charts; Acknowledgements; List of abbreviations; Introduction; 1. What communism actually was; 2. The decline and fall of socialism; 3. Strategic policy choices; 4. Changes in output and their causes; 5. Liberalization; 6. Financial stabilization; 7. Privatization; 8. Social developments and policy; 9. State and politics in the transformation; 10. Role of the outside world; 11. Conclusions; Bibliography; Index.